When will this toxic pesticide spraying end? Large sections of Brooklyn will be sprayed this evening, August 9th. The pesticide spraying program for West Nile virus in New York City is now in its 19th year. It has never been reviewed by any city agency since its inception despite the continued use of toxic, harmful and carcinogenic chemicals over the city’s population and our environment. It began in 1999 by Mayor Rudolph Giuliani, continued by Michael Bloomberg, now Bill de Blasio. 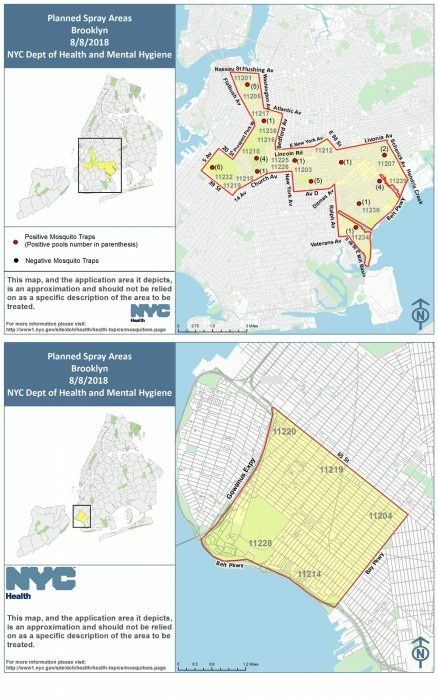 Areas being sprayed with pesticides via truck this evening (rescheduled due to rain from August 8th) include Canarsie, Clinton Hill, Fort Greene, East New York, Downtown Brooklyn, Park Slope, Windsor Terrace, Bensonhurst, and too many more (full list below). This follows spray “events” summer 2018 which began July 18th in the Bronx and have also doused parts of Staten Island and Queens. The pesticides being sprayed are harmful to human health and the health of the entire eco-system, including animals, birds, wildlife, insects, and more. They kill off natural predators of mosquitoes, including dragonflies and bats. You can view the NYC pesticide spraying schedule here. The program is run by the New York City Department of Health. “This is a HUGE area that the City is spraying in Brooklyn with carcinogenic pesticides. It comes on the heels of massive spraying in Staten Island that poisoned a number of Staten Islanders this summer and sent them to the hospital. The city’s announcement initially said they were spraying for Zika as well as West Nile, but last year the City admitted that there was absolutely no Zika threat in NYC. The adulticide (pesticide) spraying is exactly the wrong approach to dealing with mosquitoes said to be carrying West Nile virus, yet the City has been giving itself exemptions every year from Local Law 37 (passed in 2005), which sought to greatly reduce the use of toxic pesticides. In addition, the City under Mayor deBlasio, is continuing the dangerous approaches of Mayors Giuliani and Bloomberg, despite having lost a case in federal court (2006) brought by the No Spray Coalition. They’re just ignoring that court case decision and subsequent settlement, as well as the well-being of the people of NYC. Write to Mayor Bill De Blasio here. Write to your New York City Council Member here. Ask for a substantive review of this pesticide spray program which has gone unchecked since 1999. We will update the site with more actions you can take. Check back! August 6, 2018 – To reduce mosquito activity and the risk of West Nile virus, the Health Department will conduct its sixth adulticide treatment of the season. Trucks will spray pesticides in sections of Brooklyn on Wednesday, August 8 between the hours of 9 p.m. and 6 a.m. the following morning, weather permitting. In case of bad weather, application will be delayed until Thursday, August 9. Air conditioners can remain on. While unnecessary, you may wish to close air conditioner vents, or choose the recirculate function. While unnecessary, you can wash outdoor toys and equipment with soap and water. Always wash fruits and vegetables with water. encouraged to mosquito-proof their homes and take precautions when spending time outdoors. Use an approved insect repellent containing DEET, picaridin, oil of lemon eucalyptus (not for children under 3), or products that contain the active ingredient IR3535. Make sure windows have screens. Repair or replace screens that have tears or holes. Eliminate any standing water from your property and dispose of containers that can collect water. Standing water is a violation of the New York City Health Code. Keep them empty or covered if not in use. Drain water that collects in pool covers. Report standing water by calling 311 or visiting nyc.gov/health/wnv. For more information about West Nile virus, call 311 or visit nyc.gov. Hi thank you for your educative information. I wonder if there is an Association for Victims of Pesticides that could enlighten the public at large? I’ve heard they is one in Europe that is creating quite an awareness… Too many people around are not even aware of the harm done to them due to pesticides. Count me in …subscribe me on your server list… I do wish to participate in any event the best I can.